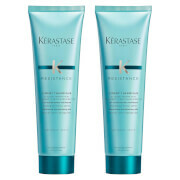 Strengthen your hair's fibre internally and protect the surface of your hair. Smoothing your hair from root to tip and firming, increasing suppleness and energy on the surface of your hair. Using Thermo-activation it increases the effect of the product when heat is applied, sealing the reconstructing agents inside the hair fibre. Recommended Hair Bath: Bain de Force or Bain Volumactive. Apply to towel-dried hair before styling. Work a small amount thoroughly into the hands. Starting at the nape area, apply mèche by mèche to mid-lengths and ends avoiding the root area. Massage-in thoroughly to give an even distribution. Repeat, finishing at the front hairline. Detangle using a wide-toothed comb starting with the ends and moving towards the roots. Do not rinse. Blow-dry using round styling brush. Style hair using flat ceramic irons or tongs. Great product - leaves hair silky soft but also strengthens hair with continuous use. The price is very affordable, very large tank. After using the effect is obvious, mild and no stimulation, after washing hair astringent, not oil, smooth and easy to comb, hair drying before use, hair is slippery. Often blowing, straighten, curl, hairdresser recommended insulation milk, really very useful! I am really lazy when it comes to protecting my hair from the heat and I hate to use a spray onto dry hair, so even when I use hot tools I tend to skip that step. However this product is great because you use it on wet hair and basically you are done for up to 5 washes (so they claim, anyway), and I can genuinely tell that is doing something good. Not cheap but it lasts quite a few months. Love this item, has a yummy citrus smell and makes your hair look delicious too. It's good for damaged hair (although i've kept using it now I've sorted my hair 3 years later) and provides heat protection. Apply a thumb sized amount through towel dried hair (lengths don't apply to scalp) then blowdry. super nourishing, makes my hair feel amazingly silky. I love this product so much, it really does work and makes a difference I the condition of my hair. I dye my hair blonde and use bleach so my hair is prone to becoming dry and brittle and this is the only thing that makes a difference. Highly recommend. 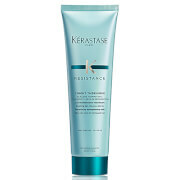 This product provides a shield against heat making the ends of the hair softer and protecting them from damage. It has nice odour and it is not greasy. I would definitely recommend it !!! 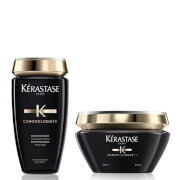 My hairdresser of 10 years introduce me to this product.. been loving it ever since.. it helps to protect the hair from the heat (i usually use curling thong) and it could also help in styling (curling last all day) and somehow this kerastase made my hair shine and look very healthy!! very much recommended. Never look back..
Great product to help strengthen hair. Smells amazing and does make my hair feel slightly thicker and more resistant. Will buy again.